I consider myself to be a fairly competent home cook but am aware that there is a huge gap in my knowledge, namely the cooking of game. I have rarely even eaten game. So when I heard that award-winning chef Neil Forbes, of Café St Honoré in Edinburgh, was coming to my local farm shop to give a masterclass on cooking game, I jumped at the opportunity. 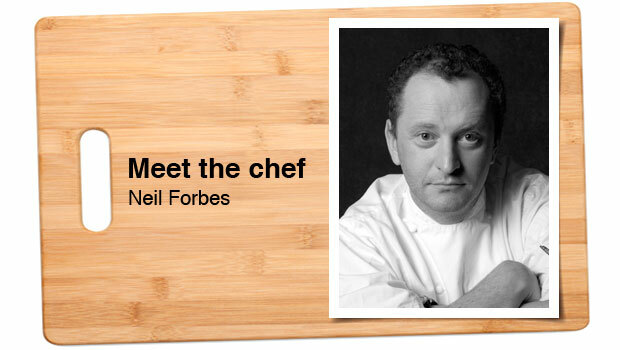 I was at Neil’s previous masterclass, also at Hopetoun Farm Shop, about simple seasonal Scottish cooking and was impressed by his ethos of sustainability. I loved it so much that I wrote my longest ever blog post, which you can read here. 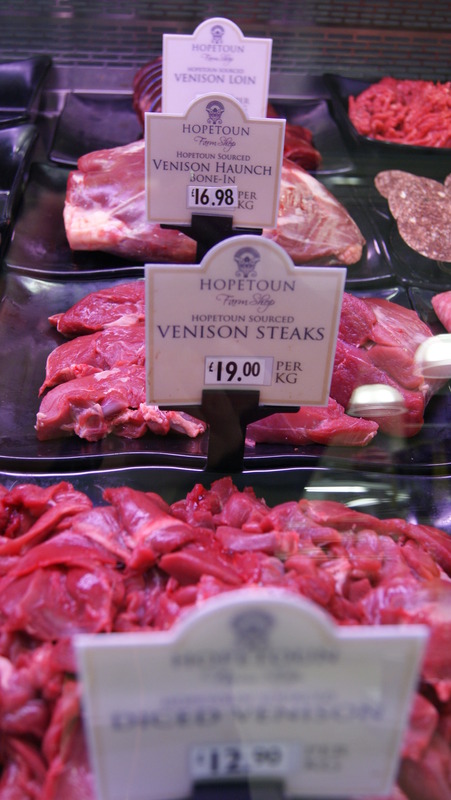 Hopetoun Farm Shop is part of the 6500 acre Hopetoun Estate, which includes woodland, moors and farmland – so is teaming with all manner of game. The gamekeeper supplies these fresh to the farm shop where they are prepped by the excellent in-store butchers, who are finalists in the prestigious Butcher Shop of the Year awards, the results of which are due to be announced this week! Most people in Scotland are aware that grouse season begins in August on the “glorious 12th”, as it is called, and lasts until Christmas but what of other Scottish game? 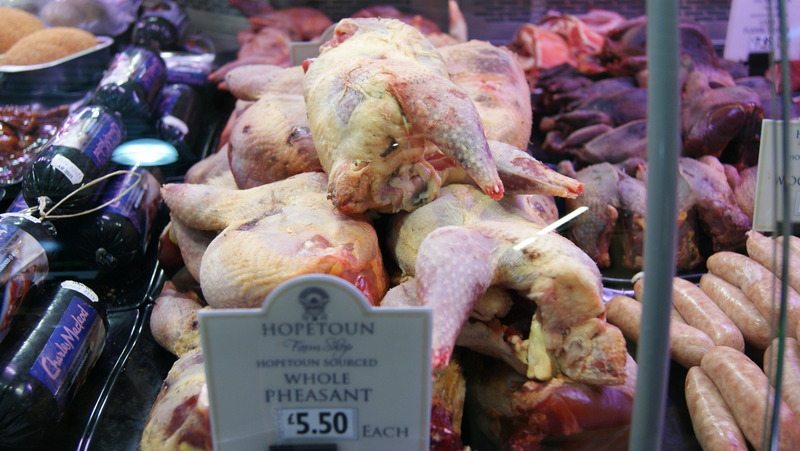 At Hopetoun Farm Shop venison, rabbit and woodpigeon are available all year round, whilst pheasant is available November to January and partridge October to December. Neil starts with pheasant, telling us that it is a good introduction to game as it is quite mild in taste, similar to chicken. 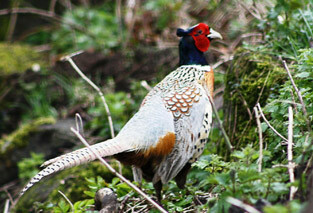 It is also more fatty than other game birds so easier to cook without drying out. 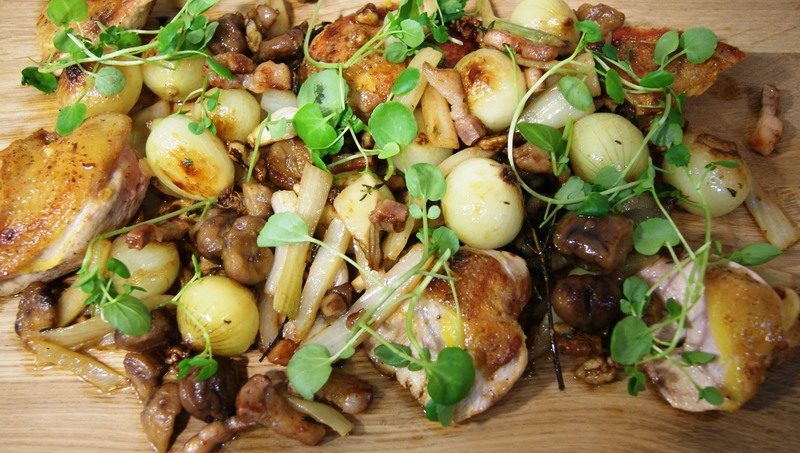 The recipe Neil is cooking is Pheasant with Chestnuts, Button Onions, Fennel and Bacon. Neil has based this dish on one created by the great French chef Robuchon, who has more Michelin stars than any other chef. First of all Neil removes the sinew from the pheasant breast, then reminds us of his mantra on seasoning – season before cooking, during cooking and after cooking. The pheasant breast is cooked skin-side down in a little oil over a medium heat for six minutes, then turned and cooked for five minutes, then turned back to skin-side down for a further few minutes. It is safe to serve any game bird slightly rare and Neil tells us to keep it a little pink for the best flavour and texture. He slices the cooked pheasant breast, returns it to the pan briefly to keep warm and serves it with the cooked mixture of button onions, bacon, walnuts, fennel and chestnuts which were flavoured with thyme, garlic and orange zest. Finally this is all decorated with a little watercress. Very pretty “autumn in a pan”, as Neil poetically quips. The pheasant tastes nice, quite similar to chicken but much moister and with a more robust flavour. For me though, the stars of this dish are the bacon, which was cured at Neil’s restaurant Café St Honoré, and the delicious button onions cooked in the bacon fat. The next dish is venison. 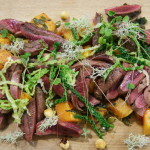 Hopetoun Estate has herds of both roe deer and red deer and their venison was awarded Gold in the Great Taste Awards 2012. Hopetoun venison was chosen by top baker Paul Hollywood to feature on his latest BBC series Pies and Puds – he recently spent a couple of days filming at the Hopetoun Estate and it will be featured on the programme later this month. Neil has chosen to cook roe deer, which he prefers over red, and today he is cooking the haunch. He heats a splash of oil in a frying pan over a high heat and sears the venison all over. Then tells us to pop it in a moderate oven for 7 to 10 minutes until medium-rare. Then it needs to rest in a warm place for about 10 minutes. 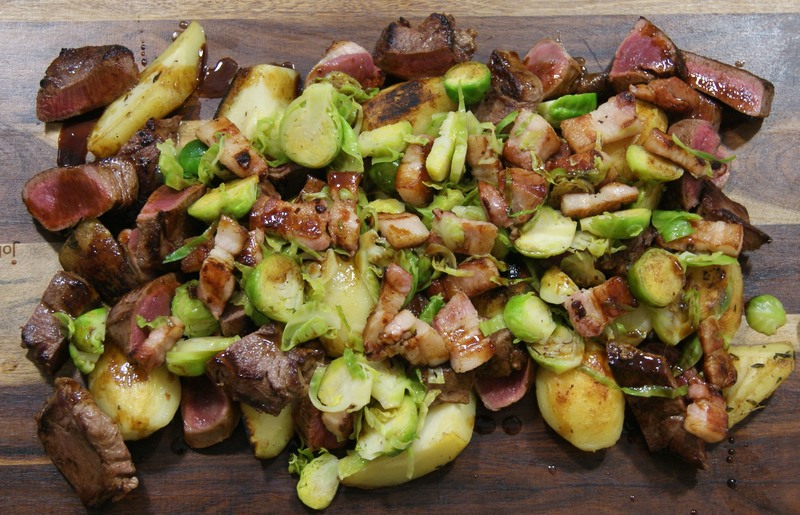 The venison is served with diced potatoes and parsnips fried together in duck fat and flavoured with thyme, bay and butter; accompanied with shredded brussel sprouts cooked with bacon, thyme and juniper berries. The dish is drizzled with a jus created from red wine, beef and venison stock, and a little chocolate. The venison is chewy but tender, with a unique flavoursome taste. The hint of chocolate in the jus is detectable but giving a rich depth of flavour, rather than any chocolate sweetness. Moving back to game birds, pigeon is the next to feature. Neil tells us that pigeon is really cheap and something we should all have a go at cooking. He mentions that one of the best-sellers at Café St Honoré just now is a fabulous smoked pigeon dish. Neil seasons the pigeon breasts and cooks them in a little oil over a medium heat for literally just a few minutes on each side. Pigeon, unlike most other food, should be cooked skin-side UP to start, otherwise it just curls up. 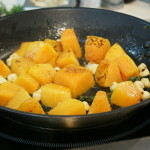 Neil leaves it to rest on a warm plate whilst preparing the accompaniments of pan-fried pumpkin with sage, hazelnuts and pumpkin seeds; and lightly boiled sliced cabbage. When he plates up he tops the dish with wood sorrel and reindeer lichen. 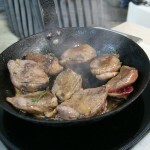 I love the pigeon, which is beautifully soft in texture like liver, but with a very delicate flavour. I am not a fan of the sage here, which I find overpowers the wonderful pigeon. I purposely make sure to taste the reindeer lichen but find it dry and uninteresting. It is certainly pretty on the plate but I know how long it takes lichens to grow (less than half a centimetre a year), so hopefully the lichen plate-dressing fad won’t catch on! The final dish of the evening is partridge. Neil starts by cooking a chopped Bramley apple in a hot pan with butter, adding a little mixed spice at the end. He seasons the partridge breasts and cooks them skin side down in a little oil over a medium heat for two minutes on each side. He then adds some jus and bastes the partridge breasts over a low heat for a few minutes. In a separate pan he crisps up some Orkney black pudding. 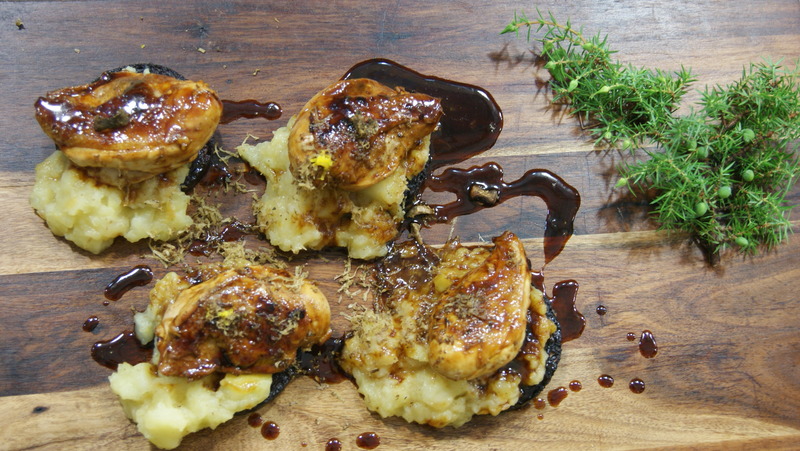 To serve, he tops the black pudding with the stewed apple, then the partridge, drizzles with jus and then adds some freshly ground black pepper and grated white truffle. Although the texture of the partridge is wonderful, I find it the blandest game bird of the evening and feel the taste is overpowered by the apple. Having said that, the apple and black pudding together are wonderful and a combination I will definitely be adding to my repertoire. 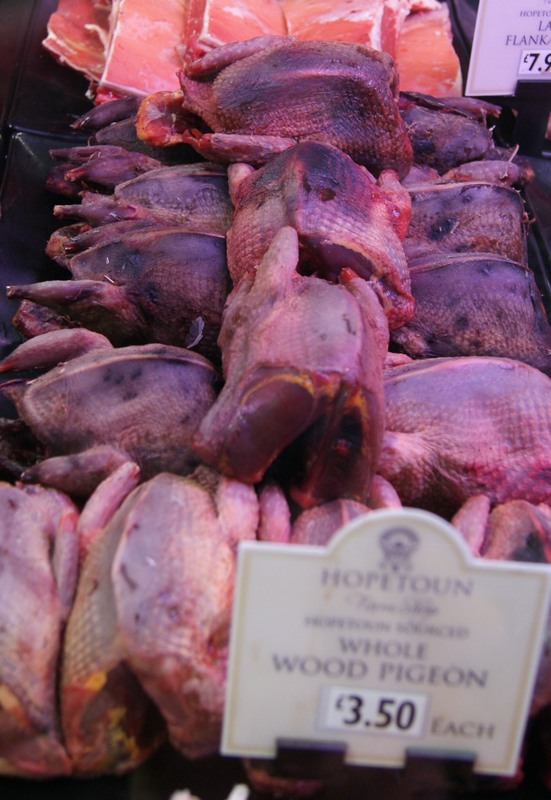 For me the tastiest game of the four we tried was the wood pigeon and I just had to buy one on my way out. It was a wonderful evening, with Chef Neil showing us how easy and quick it is to cook game. I now wonder why I ever felt nervous about it! So, tell me dear reader, do you like game and have you ever cooked it? P.S. Special mention must go to Camille Craig of Hopetoun who took all the photographs during the event and kindly allowed me to use them. Thanks Camille. P.P.S. I received a complimentary ticket to the masterclass – thank you Hopetoun Farm Shop – in return for writing this blog post. I was not told what to write and all views and opinions are my own.